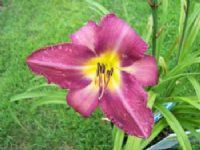 This is considered a "Classic" daylily, which means that it has been selected as a highly performing plant with exceptional Bloom performance, substantive, vibrantly colored flowers, complete winter hardiness in our Northern zone, and Vigorous habit. Daylilies can survive many harsh conditions that other plants cannot: including slopes, poor and dry soils. Very easy to grow! Pick up Only at Our Gift & Garden Shop!